I was tempted to go drop $8500 on these awesome speaker cables so I could be like Whiplash (see customer pictures), but I'm curious, if I use them for my audio system, will they actually make a perceptible difference over some low gauge copper wire? At what point do speaker cables start to suffer diminishing returns, and do "audiophiles" actually have the uncanny ability to detect the differences? The only perceptible difference will be the tilt of your seated body due to a substantially smaller wallet. Unless you require speaker cable runs of 50+ feet, where shielding is actually important, there are no benefits to the exorbitantly expensive speaker cabling. There have been anectodal, supposedly blind tests confirming that Monster(tm) cables sound no better than a coat hanger. We gathered up a 5 of our audio buddies. We took my "old" Martin Logan SL-3 (not a bad speaker for accurate noise making) and hooked them up with Monster 1000 speaker cables [ed. Monster Ultra Series THX 1000 Audio Interconnects] (decent cables according to the audio press). We also rigged up 14 gauge, oxygen free Belden stranded copper wire with a simple PVC jacket. Both were 2 meters long. They were connected to an ABX switch box allowing blind fold testing. Volume levels were set at 75 dB at 1000KHz. A high quality recording of smooth, trio, easy listening jazz was played (Piano, drums, bass). None of us had heard this group or CD before, therefore eliminating biases. The music was played. Of the 5 blind folded, only 2 guessed correctly which was the monster cable. (I was not one of them). This was done 7 times in a row! Keeping us blind folded, my brother switched out the Belden wire (are you ready for this) with simple coat hanger wire! 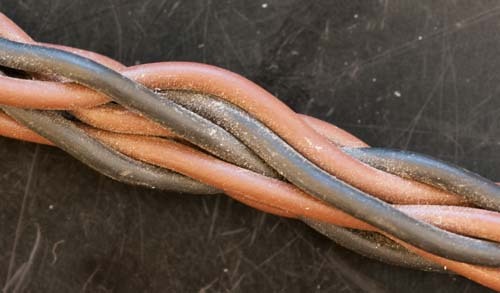 Unknown to me and our 12 audiophile buddies, prior to the ABX blind test, he took apart four coat hangers, reconnected them and twisted them into a pair of speaker cables. Connections were soldered. He stashed them in a closet within the testing room so we were not privy to what he was up to. This made for a pair of 2 meter cables, the exact length of the other wires. The test was conducted. After 5 tests, none could determine which was the Monster 1000 cable or the coat hanger wire. Further, when music was played through the coat hanger wire, we were asked if what we heard sounded good to us. All agreed that what was heard sounded excellent, however, when A-B tests occurred, it was impossible to determine which sounded best the majority of the time and which wire was in use. This site also lists some double blind tests where listeners could not pick the difference between $990 "T2" Speaker Cable and cheap 16 Gauge Zip Cord. There are a number of possibilities for ways that speaker wire could affect sound. Larger wire will reduce DC resistance. Larger wire that isn't stranded will increase inductance, which will lead to increased impedance at higher frequencies. The insulation used will affect the capacitance between the wires. The construction of the cable (e.g., straight zip wire versus twisted or braided wires) will affect the degree to which outside electrical signals will induce a signal in the wire. The upper trace went through the Kimber cable, the lower through the zip cord. As is pretty easily visible, there's clearly more noise present on the signal that went through the zip cord. 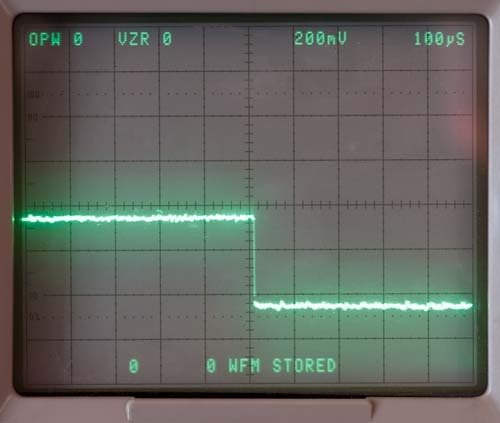 Now, I should point out that this is only a 400 mV signal, and the noise on it is peaking at about 150 mV. That means the power it represents is quite small: P = E2/R, and it's driving a 10 megohm oscilloscope input, giving roughly 2 1/4 nanowatts. If, for example, you were listening to music using an average of 1 watt, that would be a noise level around 86 dB down. Caveat: this is measuring well up into the radio frequency range, so a loudspeaker may not be able to reproduce all the noise being measured here -- but most of it is almost certainly at 60 Hz, which most loudspeakers can reproduce. OTOH, this is noise induced after the amplifier, so it will remain nearly constant regardless of how loudly or softly you have the volume set. I'd have some serious doubts about being able to hear noise that's 86 dB down from the signal, but if you turn the volume down a lot, this would remain (at least close to) constant, and I can believe that it might start to become audible. 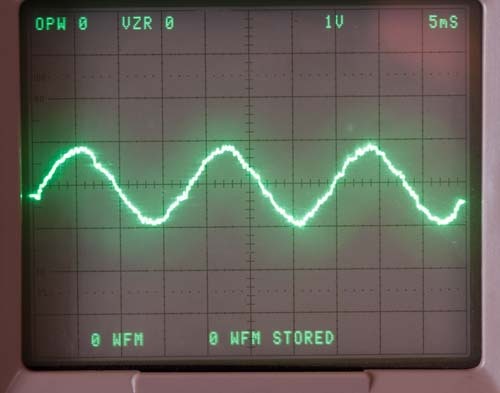 The basic sine wave is at 60 Hz, and the "roughness" of it represents the signals at other frequencies. Obviously, the vast majority is at 60 Hz. At least offhand, I can't see enough difference between the direction connection and the Kimber cable to claim I'm measuring any difference at all. Perhaps tests at higher frequencies or using different signals, etc. would show some difference, but at least based on what I've seen in this test, I can't claim to measure anything. The difference between zip cord and "real" speaker wire is measurable, and right at the point that it's difficult to say with certainty whether it's really audible or not. The "real" speaker wire I used, however, is passing the signal through cleanly enough that I'm extremely doubtful that anything else could pass the signal much more cleanly (though perhaps a lot longer cable would degrade the signal enough to leave room for something else to be better). I don't know what the Kimber cable cost, but since they threw it in with an amplifier that cost something like $600 (IIRC) I'd be quite surprised if it was more than $15-20 or so -- certainly not even close to thousands of dollars in any case. 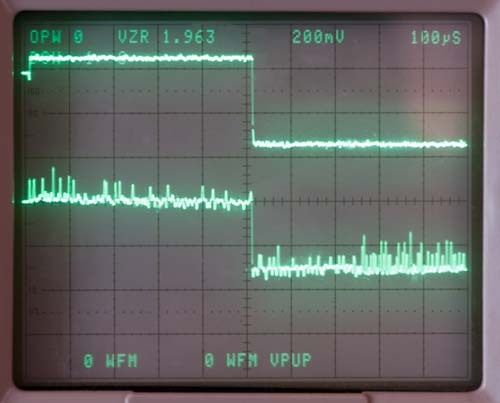 For what it's worth, the scope is a Tektronix 7854, and I used a 7A26 vertical input amplifier and 7B85 horizontal unit. Realistically, the 'scope probably doesn't make much difference though. It would be a lot harder to duplicate the exact wire I used -- I can't find a brand marking on it; all it says is 60o, UL/CSA approved, 16 AWG. For that matter, the room your stereo is in probably won't have exactly the same level of RFI as my office -- but I don't have any particular reason to believe my office is particularly above or below average either. Not the answer you're looking for? Browse other questions tagged perception sound . New LED TV - Need Monster Cable HDMI for $$$ or do regular HDMI work just as well? Do falling bombs make whistling sounds? Does different sampling rate make a difference human can hear?